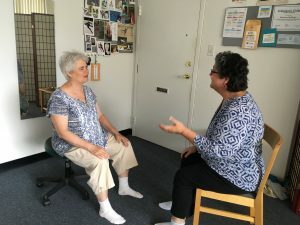 Maureen, on the left, is listening to a client bring her up-to-date on the events of the past week. The Individual Session is a time together when we focus on what is going on with you right now and what improvements you would like to see take place. We begin each session with conversation. During the initial session I ask you in some detail about your current situation and how it developed. In subsequent sessions you bring me up to date on developments since we last met. The Individual Session is a completely custom process. I adapt to you. 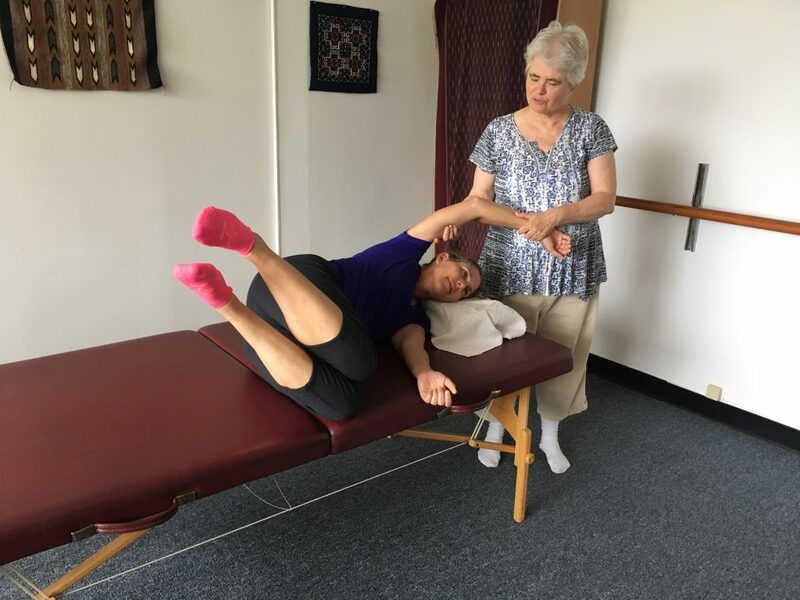 It is important to me to be clear that Feldenkrais is an educational process — a training process — and not medical treatment. 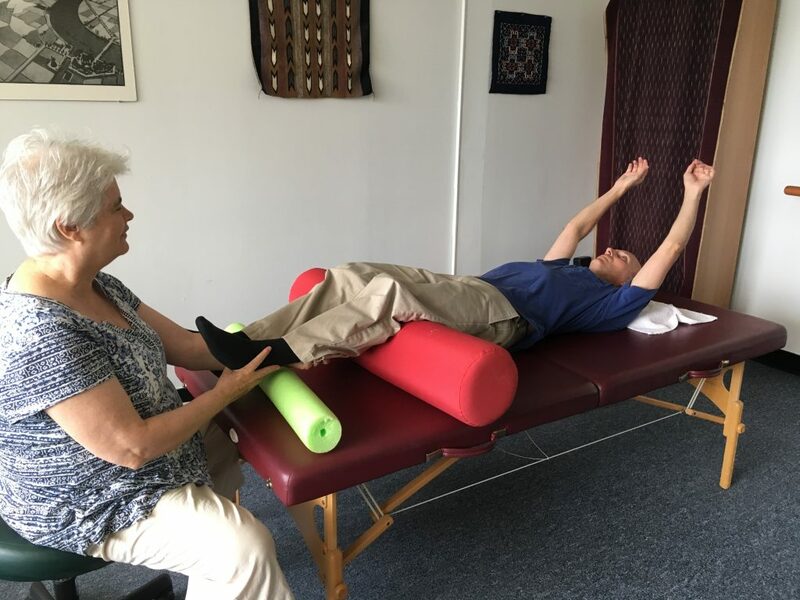 Most people who come to me are in pain and have already seen many other practitioners, many of them medical professionals, where the process is treatment. I can help by bringing a different, educational approach. working on being more often — and more fully — present in the moment. Many of our troubles come from not being sensitive to the body. And some problems come from trying to do too many things at once! Below are responses to some Frequently Asked Questions. if I am early, is there some place to wait? 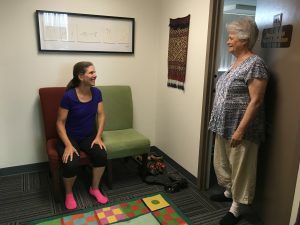 Client Amy, in her favorite pink socks, has been waiting for a few minutes in the waiting area that I share with my next-door office neighbor. We leave shoes outside, whenever possible. Yes, there is a waiting area. I share it with my next door office neighbor. While you are waiting, please no cell phone calls, nor food or drink. If you are comfortable leaving your shoes outside, that helps to keep the room clean. I also ask that you wear socks. When should I schedule an Individual Session? Some people take Individual Sessions only, some take them as preparation for the group class, and some in combination with the group class. 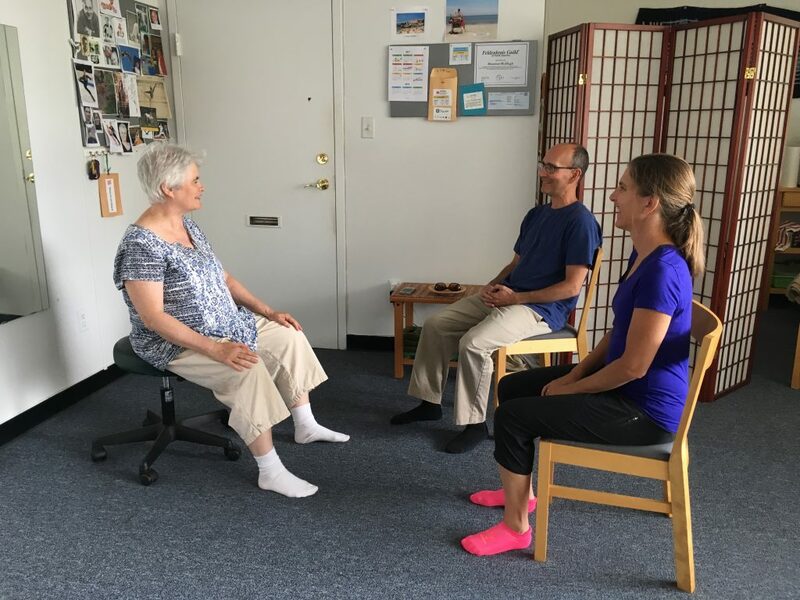 Whenever possible, it is good to schedule an Individual Session before taking a group class. This is especially important if you have a marked chronic or acute condition, or if you have any other individual needs. In this first private session, we evaluate and make a plan. There is no set number of sessions. To begin, it will take one session. 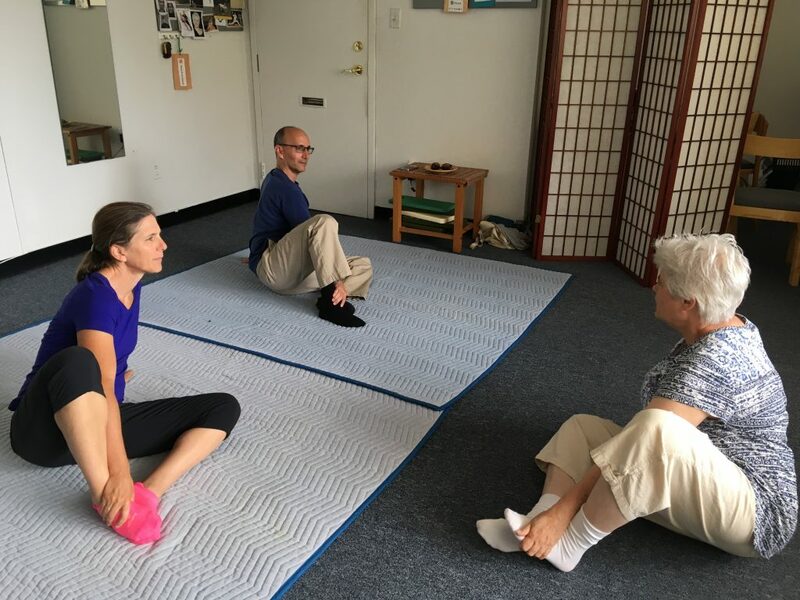 No one knows what Feldenkrais is until they have tried it. Commonly in the first session, one can get an improvement which is the basis for more improvements in subsequent sessions. In the beginning it is best to come frequently. Once the improvements have settled in, one can taper. What happens during an individual session? Here is a series of photos from a married couple who shared a session. Sometimes friends share a session. 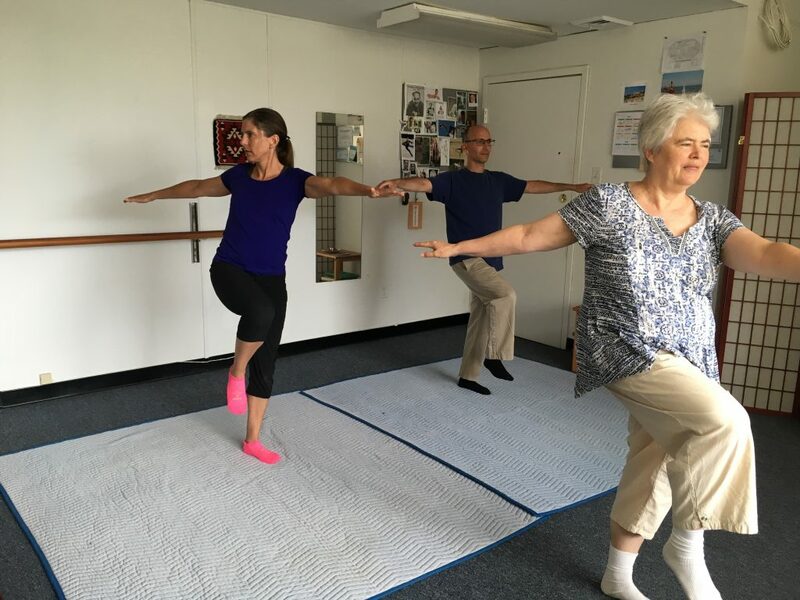 I am learning that this couple would like to work on balance and limberness. 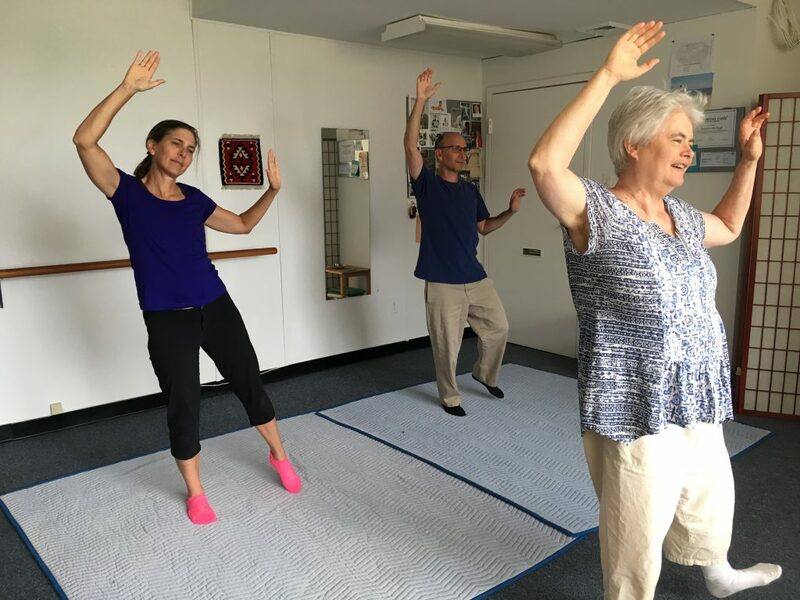 One balance strategy is called “Long on the weighted side.” It means that on the weighted side, here the right side, the upper body — including the ribs, arm, and even the ear — elongate away from the waist; and the hip and leg sink down. also away from the waist. On the unweighted side, here the left, it is the inverse: upper and lower body scrunch up toward the middle. In this sequence you become more aware of the counterbalancing sensations of expansion and contraction. These are shifts around the front-to-back axis, called in math Z. Coming down to the floor, a move that will round the back begins by placing a hand on a foot. Bending movements like these are around the horizontal axis, called in math X. Moves like this are common in infancy and childhood, but, for most people, not in the adult repertoire. Revisiting this as an adult can take years off your age! Something that feels good is to send the knees one way and the upper body the other. Here, the lower body is turning left, and the upper body is sliding right. A move like this brings welcome mobility to a spine that doesn’t want to hunch. 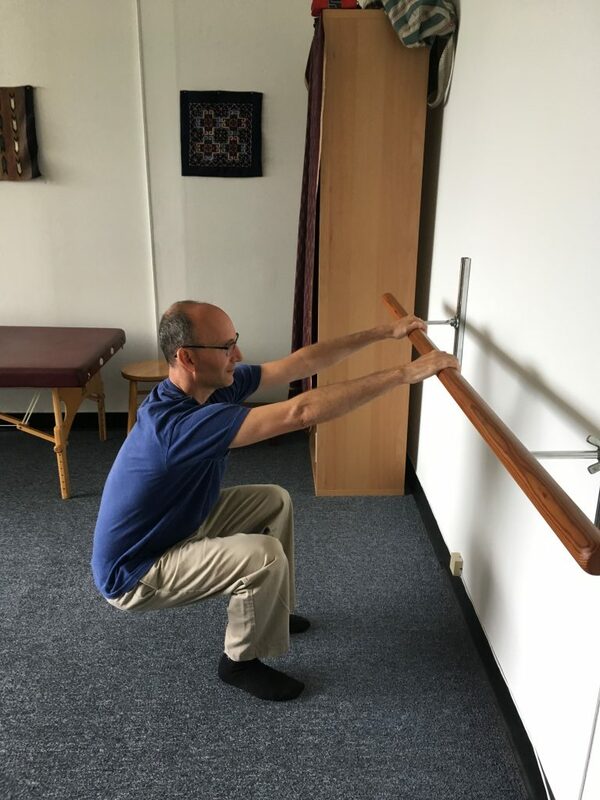 The ballet barre has numerous uses, including being helpful as one explores squatting. Sitting as much as we do keeps the hip joints at a fixed angle. Squatting is revitalizing. 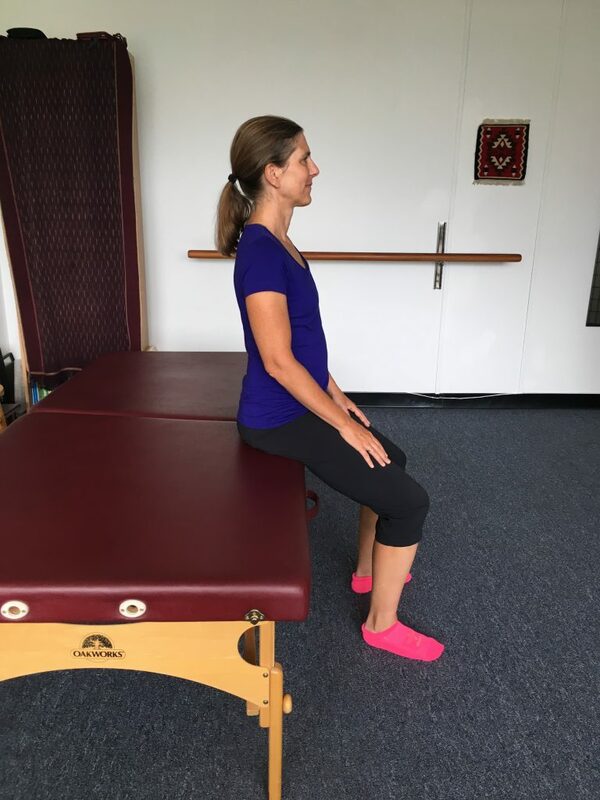 Using the table makes it easier for me to stand and guide the arms and body to the left. We are exploring a rolling coordination where the head and neck move in synch with the torso and legs. The experience of partnership while lying on the back can help the neck feel more at ease when the body is upright. A movement on the side uses the ribs, legs and hips to help motor the arm upward. 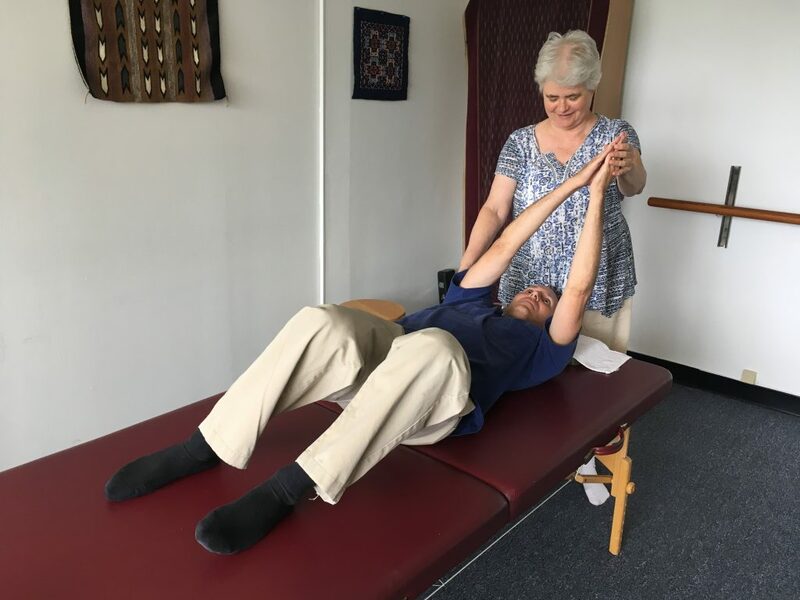 A common Feldenkrais approach is to look for how the teamwork of the whole body can restore ease to a single part that has become uncomfortable. Sitting up after having been on the table and feeling effortlessly good posture! Good posture, for so many people, is lying right beneath the surface, just waiting to reappear once the unnecessary tensions have let go. Regular session. 50 Minutes. $120. Long session. 75 Minutes. $180. Short session. 35 Minutes. $90. You can pay by Zelle*, Cash, Check, Mastercard, Visa, Discover or American Express. Zelle is my favorite payment method, and check the second favorite. Checks are made out to Maureen McHugh. If you write your check in advance, session time is not needed for this task. *Zelle is a payment service that you can use from your phone. There is no fee to anyone. It is provided by a consortium of big banks, including Bank of America. It is similar to Venmo, which is provided by PayPal. Please wear loose, comfortable, layered clothing, suitable for light exercise. You will be more comfortable in baggy pants rather than tight jeans. It is best when the top is plain in texture – without woven ridges or printed designs. Please wear, or bring, clean socks. 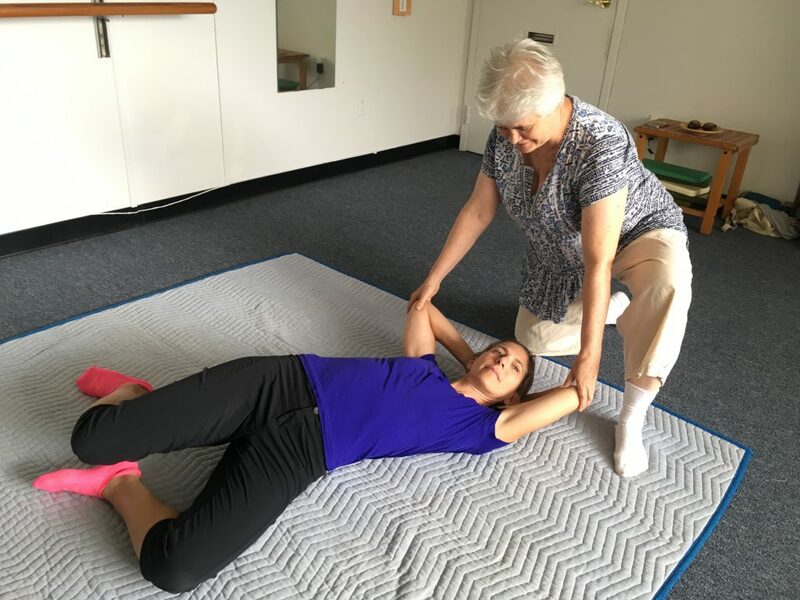 Is Feldenkrais covered by insurance? If you have a Flexible Medical Spending Account (your own money, pre-tax), paperwork will be provided. Most people get reimbursement. Can I share a session with another person? Up to four people may book an Individual Session together. The fee is the same as for one person. The office is in the Landmark section of Alexandria. The building is Landmark Tower, a high rise. It is mostly residential, but the first three floors are commercial. There is plenty of free outdoor parking. Parking is available on three sides of the building plus on Whiting Street. The largest parking area is in the back. At the entrances to the parking lot there are fierce signs that warn of towing. Please do not worry about these! They only tow at night. Yes. The appointment is made with a 24-hour cancellation policy. You may make any changes with 24 hours notice. Short of that, you are charged the whole fee. If there is a weather advisory — snow, wind, rain — or any other condition that affects personal and public safety, the 24 hour policy does not apply. Safety first! Yes. On request, email receipts are provided. Yes, there are two short forms. If possible, it is nice if you can fill them out in advance, print them out and bring them with you.